The 2017 Toyota Sequoia is a full-size and full-featured Sport Utility Vehicle. This is a vehicle that was built to adventure. Housing enough room to carry all your gear and passengers, this SUV can handle anything life throws its way. The Toyota Sequoia trim levels are generously equipped, come with impressive performance specs, and able capabilities. The Sequoia has a variety of trims so that drivers can find the Sequoia that is properly equipped for them. With high-tech gadgets, sophisticated interior features, and forward-thinking safety, the Sequoia is the ultimate SUV. This new SUV has a generous amount of space in its interior and its cargo hold so you can be prepared for anything. Plus, the cargo area is configurable, so you can easily modify your arrangements to fit a variety of needs. The performance of the Sequoia is impressive. This SUV was engineered to be able to tackle the tough conditions with ease, giving you peace of mind while on the road. In addition to impressive performance, the Sequoia also offer advanced technologies to help you stay alert and secure on the road. Leasing a vehicle has an array of benefits. Not only does it allow you to get into a new vehicle with less commitment, it also, in general, lets you have lower payments than you would if you would buy. It also allows you versatility. Leasing lets you choose your vehicle freely without the associated commitment of driving a new vehicle off the lot. Plus, average lease terms are generally less than the amount of time you would own a new vehicle before trading it in. This allows you to stay up to date in the automotive market, without having to worry about your vehicle's trade in value. To learn more about Toyota financing, visit our car finanancing department! Interested in a New Toyota Sequoia? The 2018 Toyota Sequoia can tow up to 7,400 lbs. 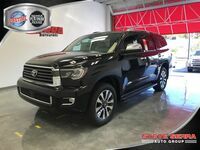 The 2018 Toyota Sequoia comes equipped with a 5.7L i-FORCE V8. The Star Safety System™ and the Toyota Safety Sense™ P (TSS-P) system comes standard on all 2018 Toyota Sequoia models. The 2018 Toyota Sequoia is built to be tough and comfortable with soft touch materials and convenience features throughout the cabin. Standard features on this model include Entune™ Audio Plus with Connected Navigation App, Multi-Informational Display, and more! The 2018 Toyota Sequoia can achieve 13 city/17 highway mpg*.